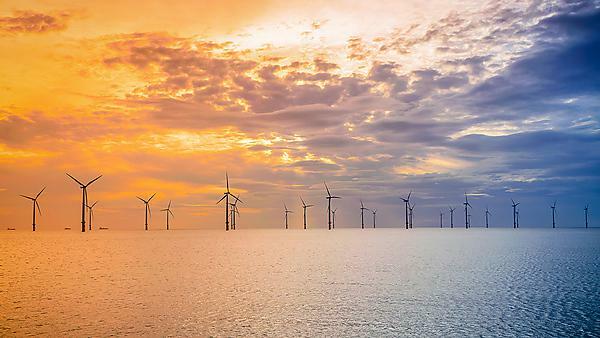 Sunset Offshore Wind Turbine in a Wind farm under construction of England coast, UK. Image courtesy of Getty Images. A national consortium led by the University of Plymouth has been awarded £5million to bring together a network of academic, industrial and policy stakeholders to champion and maintain the UK’s world-leading expertise in Offshore Renewable Energy (ORE). ORE Supergen is part of a programme of initiatives being funded by the Engineering and Physical Sciences Research Council (EPSRC) and brings together the related research areas of wave, tidal and offshore wind. Its aim is to maintain the UK’s leading position in the field and to address any technical, environmental and interdisciplinary challenges which require a coordinated response at a national and regional level. It will build a collaborative approach which will bring the added benefits of spreading best practice through the research community, supporting equality and diversity, and ensuring support of early career researchers. Supergen ORE Hub will be led by Professor Deborah Greaves OBE, Head of the School of Engineering at the University of Plymouth, working alongside academics from the University of Aberdeen, University of Edinburgh, University of Exeter, University of Hull, University of Manchester, University of Oxford, University of Southampton, University of Strathclyde, and the University of Warwick. The programme announced by the EPSRC also includes hubs focusing on bioenergy and energy networks, and a new £1million solar energy network. In total, the four initiatives will involve academics from 19 universities and 70 stakeholder partners, including 22 from industry. The University is a leader in marine renewable energy research. The COAST Engineering Research Group has particular strengths in physical and numerical modelling of marine renewable energy devices, supported by our state the art COAST Lab facilities. The University is also a key partner in the Partnership for Research in Marine Renewable Energy (PRIMaRE).